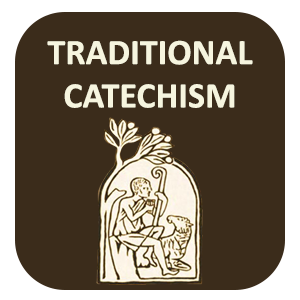 As we saw in our Catechism lesson, The Holy Spirit: At Creation, He first occurs in the second verse of the Bible, Genesis 1:2,and was actively involved in the creation of the earth. In the closing books of the Old Testament, the Holy Spirit is frequently mentioned, that last clear reference being found in (Malachias/Malachi 2:15.) "Did not One make her, and she is the residue of His Spirit? And what doth one seek, but the seed of God? Keep then your spirit, and despise not the wife of thy youth." Let us consider a number of the passages in which the Holy Spirit is mentioned. Let us look to the ways in which the Spirit worked in the days of the Old Testament. 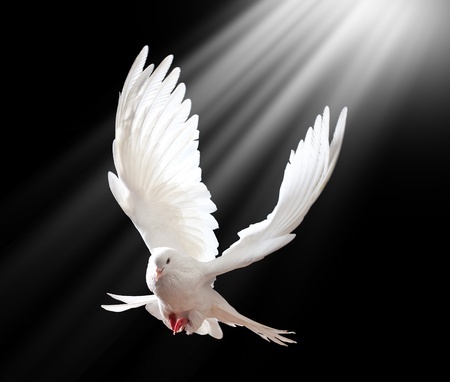 The Holy Spirit is described as creative, life-giving, and life-sustaining. Is it any wonder that in the New Testament He would be similarly described (John 3:5-8; 6:63; 2 Corinthians 3:6)? At least before the Flood. And thou gavest them thy good Spirit to teach them, and thy manna thou didst not withhold from their mouth, and thou gavest them water for their thirst. Yet now take courage, O Zorobabel, saith the Lord, and take courage, O Jesus the son of Josedec the high priest, and take courage, all ye people of the land, saith the Lord of hosts: and perform (for I am with you, saith the Lord of hosts) The word that I covenanted with you when you came out of the land of Egypt: and my spirit shall be in the midst of you: fear not. (Aggeus/Haggai 2:5-6). And I have filled him with the Spirit of God, with wisdom and understanding, and knowledge in all manner of work. (Exodus 31:3). And Moses said to the children of Israel: Behold the Lord hath called by name Beseleel the son of Uri the son of Hur of the tribe of Juda. And hath filled him with the Spirit of God, with wisdom and understanding and knowledge and all learning. To devise and to work in gold and silver and brass, and in engraving stones, and in carpenters' work. Whatsoever can be devised artificially, he hath given in his heart: Ooliab also the son of Achisamech of the tribe of Dan: Both of them hath he instructed with wisdom, to do carpenters' work and tapestry, and embroidery in blue and purple, and scarlet twice dyed, and fine linen, and to weave all things, and to invent all new things. Beseleel, therefore, and Ooliab, and every wise man, to whom the Lord gave wisdom and understanding, to know how to work artificially, made the things that are necessary for the uses of the sanctuary, and which the Lord commanded. (Exodus 35:30–36:1). That I may come down and speak with thee: and I will take of thy spirit, (refering to the Holy Spirit that God had given Moses) and will give to them, that they may bear with thee the burden of the people, and thou mayest not be burthened alone. And the Lord came down in a cloud, and spoke to him, taking away of the spirit that was in Moses, and giving to the seventy men. And when the Spirit had rested on them they prophesied, nor did they cease afterwards. Now there remained in the camp two of the men, of whom one was called Eldad, and the other Medad, upon whom the Spirit rested; for they also had been enrolled, but were not gone forth to the tabernacle. And when they prophesied in the camp, there ran a young man, and told Moses, saying: Eldad and Medad prophesy in the camp. Forthwith Josue the son of Nun, the minister of Moses, and chosen out of many, said: My lord Moses forbid them. But he said: Why hast thou emulation for me? O that all the people might prophesy, and that the Lord would give them his Spirit! (Numbers 11:17, 25-29). And the Lord said to him: Take Josue the son of Nun, a man in whom is the Spirit, and put thy hand upon him. (Numbers 27:18). And Josue the son of Nun was filled with the spirit of wisdom, because Moses had laid his hands upon him. And the children of Israel obeyed him, and did as the Lord commanded Moses. (Deuteronomy 34:9). And they came to the foresaid hill, and behold a company of prophets met him: and the Spirit of the Lord came upon him, and he prophesied in the midst of them. (1 Kings /1 Samuel 10:10). And the Spirit of the Lord came upon Saul, when he had heard these words, and his anger was exceedingly kindled. (1 Kings / 1 Samuel)11:6). But David fled and escaped, and came to Samuel in Ramatha, and told him all that Saul had done to him: and he and Samuel went and dwelt in Najoth. And it was told Saul by some, saying: Behold David is in Najoth in Ramatha. So Saul sent officers to take David: and when they saw a company of prophets prophesying, and Samuel presiding over them, the Spirit of the Lord came also upon them, and they likewise began to prophesy. And when this was told Saul, he sent other messengers: but they also prophesied. And again Saul sent messengers the third time: and they prophesied also. And Saul being exceedingly angry, Went also himself to Ramatha, and came as far as the great cistern, which is in Socho, and he asked, and said: In what place are Samuel and David? And it was told him: Behold they are in Najoth in Ramatha. And he went to Najoth in Ramatha, and the Spirit of the Lord came upon him also, and he went on, and prophesied till he came to Najoth in Ramatha. And he stripped himself also of his garments, and prophesied with the rest before Samuel, and lay down naked all that day and night. This gave occasion to a proverb: What! is Saul too among the prophets? (1 Kings/1 Samuel 19:18-24). Then Samuel took the horn of oil, and anointed him in the midst of his brethren: and the Spirit of the Lord came upon David from that day forward: and Samuel rose up, and went to Ramatha. But the spirit of the Lord departed from Saul, and an evil spirit from the Lord troubled him. (1 Kings /1 Samuel 16:13-14). Therefore the Spirit of the Lord came upon Jephte, and going round Galaad, and Manasses, and Maspha of Galaad, and passing over from thence to the children of Ammon, (Judges 11:29). And the Spirit of the Lord began to be with him in the camp of Dan, between Saraa and Esthaol. (Judges 13:25). And the Spirit of the Lord came upon Samson, and he tore the lion as he would have torn a kid in pieces, having nothing at all in his hand: and he would not tell this to his father and mother....And the Spirit of the Lord came upon him, and he went down to Ascalon, and slew there thirty men, whose garments he took away and gave to them that had declared the riddle. And being exceeding angry he went up to his father' s house: (Judges 14:6, 19). And when I am gone from thee, the spirit of the Lord will carry thee into a place that I know not: and I shall go in and tell Achab, and he not finding thee, will kill me: but thy servant feareth the Lord from his infancy. (III Kings/I Kings 18:12). And when they were gone over, Elias said to Eliseus: Ask what thou wilt have me to do for thee, before I be taken away from thee. And Eliseus said: I beseech thee that in me may be thy double Spirit...... And he took up the mantle of Elias, that fell from him: and going back, he stood upon the bank of the Jordan, And he struck the waters with the mantle of Elias, that had fallen from him, and they were not divided. And he said: Where is now the God of Elias? And he struck the waters, and they were divided, hither and thither, and Eliseus passed over. And the sons of the prophets at Jericho, who were over against him, seeing it said: The Spirit of Elias hath rested upon Eliseus. And coming to meet him, they worshipped him, falling to the ground, (IV Kings/ II Kings 2:9, 13-15). Come ye near unto me, and hear this: I have not spoken in secret from the beginning: from the time before it was done, I was there, and now the Lord God hath sent me, and his Spirit. Thus saith the Lord thy redeemer, the Holy One of Israel: I am the Lord thy God that teach thee profitable things, that govern thee in the way that thou walkest. (Isaias/Isaiah 48:16-17). This was the vision of the likeness of the glory of the Lord. And I saw, and I fell upon my face, and I heard the voice of one that spoke. And he said to me: Son of man, stand upon thy feet, and I will speak to thee. And the Spirit entered into me after that he spoke to me, and he set me upon my feet: and I heard him speaking to me, And saying: Son of man, I send thee to the children of Israel, to a rebellious people, that hath revolted from me, they, and their fathers, have transgressed my covenant even unto this day. (Ezechiel/Ezekiel 2:1-3; cf. also 3:12, 14, 24; 11:1, 5, 24; 13:3; 43:5). Till their colleague Daniel came in before me, whose name is Baltassar, according to the name of my god, who hath in him the spirit of the holy gods: and I told the dream before him. Baltassar, according to the name of my god: He says this, because the name of Baltassar, or Belteshazzar, is derived from the name of Bel, the chief god of the Babylonians. Baltassar, prince of the diviners, because I know that thou hast in thee the spirit of the holy gods, and that no secret is impossible to thee: tell me the visions of my dreams that I have seen, and the interpretation of them. (Daniel 4:5-6 Douay Rheims). I king Nabuchodonosor saw this dream: thou, therefore, O Baltassar, tell me quickly the interpretation: for all the wise men of my kingdom are not able to declare the meaning of it to me: but thou art able, because the spirit of the holy gods is in thee. (Daniel 4:15 Douay Rheims). There is a man in thy kingdom that hath the spirit of the holy gods in him: and in the days of thy father knowledge and wisdom were found in him: for king Nabuchodonosor thy father appointed him prince of the wise men, enchanters, Chaldeans, and soothsayers, thy father, I say, O king:(Daniel 5:11). St. Cyril recognizes recognizes that the spirit Belteshazzar mentions is actually the Holy Spirit. But yet I am filled with the strength of the Spirit of the Lord, with judgment, and power: to declare unto Jacob his wickedness, and to Israel his sin. (Micheas/Micah 3:8). But the Spirit came upon Amasai the chief among thirty, and he said: We are thine, O David, and for thee, O son of Isai: peace, peace be to thee, and peace to thy helpers. For thy God helpeth thee. So David received them, and made them captains of the band. (1 Paralipomenon/1 Chronicles 12:18). And the Spirit of God came upon Azarias the son of Oded, (2 Paralipomenon/2 Chronicles 15:1). And Jahaziel the son of Zacharias, the son of Banaias, the son of Jehiel, the son of Mathanias, a Levite of the sons of Asaph, was there, upon whom the Spirit of the Lord came in the midst of the multitude, (2 Paralipomenon/2 Chronicles 20:14). The Spirit of God then came upon Zacharias the son of Joiada the priest, and he stood in the sight of the people, and said to them: Thus saith the Lord God: Why transgress you the commandment of the Lord which will not be for your good, and have forsaken the Lord, to make him forsake you? (2 Paralipomenon/2 Chronicles 24:20). In nearly all of these cases, the reference to the Holy Spirit is clear, although there are some instances where the Holy Spirit and the human “spirit” seem almost to merge, so that the Holy Spirit is referred to as the “Spirit of Elijah” (cf. IV Kings /II Kings 2:9-15). This is also the case with the “Spirit” which was on Moses, which also came upon the seventy elders who were to help him (Numbers 11:17-29). Regardless of the infrequency of the precise term, “Holy Spirit,” the person and work of the Holy Spirit in the Old Testament times is much more prominent than one would suppose, apart from a consideration of the many texts referring to Him. The Spirit of God is almost immediately introduced in the Book of Genesis (1:2), and He becomes a frequent focus in the writings of the prophets. The Holy Spirit had a significant role in the creation of the world (Genesis 1:2). He inspired men who revealed God to men, either in word, or in work. He instructed and guided men, especially the nation Israel. The Spirit of God instructed and guided not only the nation Israel as a whole, but men individually (e.g. David, I Kings/1 Samuel 16:13-14; Psalm 142:10). He enabled and empowered men to do that which was humanly impossible (e.g., the judges of Israel). He manifested not only the power of God through men (Isaiah 63:10-14) but the presence of God among men (Psalm 52:11; 138:7; Aggeus/Haggai 2:4-5). It seems as well that the Holy Spirit was the instrument through whom the glory of God was manifested (cf. Aggeus /Haggai 2:3-9). The Holy Spirit therefore appears to be the agency through which God most often worked. God used men to reveal His will and His word (e.g. the prophets), but these men were inspired and empowered by the Holy Spirit so that the words they spoke were clearly the “Word of the Lord.” When men spoke in the Spirit, they spoke for God. When men disobeyed the Word of God, they were regarded as having not only resisted God, but His Spirit as well (Esdras /Nehemiah 9:20, 30; Psalm 105:33; Isaias/Isaiah 30:1-2; 63:10-14; Zacharias/Zechariah 7:11-12). One of the Holy Spirit’s tasks was to accomplish divine communication from God to men, such as the empowering of the prophets. Another task was an illuminating and teaching ministry which enabled men to understand that which God had revealed in the Scriptures. David, in the psalms, seems to be especially sensitive to this ministry. Thus, when he prays that God would “open his eyes” to behold wondrous things from God’s law (Psalm 118:18), I believe he was praying for the teaching and illuminating ministry of the Holy Spirit. When the people of Israel willfully turned their backs on God and rebelled against His Word, they grieved His Holy Spirit. As a result, as I understand it, the Spirit ceased to illumine them to the meaning of the law, except through the prophets, from time to time. Men ceased to read God’s law in terms of its “spirit” (conveyed by the Spirit), but rather in terms only of its “letter.” It is no wonder that the kinds of interpretation we see the Jewish religious leaders holding in the Gospels was the order of the day. The Savior’s teaching in the Sermon on the Mount was not the overturning of the Law (which He came to fulfill, not to put away), but the interpretation of the Law as God had always intended it—in terms of its spirit, and not just of its letter (cf. 2 Corinthians 3:6). Unbelief and disobedience led to a perversion of the Word of God, because the teaching of the Spirit ceased when He was grieved. When I consider the ministry of the Holy Spirit in the Old Testament, I am taken aback by the prominence of the third person of the Trinity. While the Spirit of God may not be clearly distinguished from God, so that the doctrine of the Trinity was crystal clear, He is described as being God, and as the agency which God used to accomplish His purposes in the world. The frequency of the references to the Holy Spirit is much greater than I expected and the extent of His ministry much broader.